Seriously, how is it already almost NOVEMBER?!?! We can’t turn back time so we might as well embrace the fact that we only have two more months left in the year. The challenge this month is geared towards working on your cardio endurance. 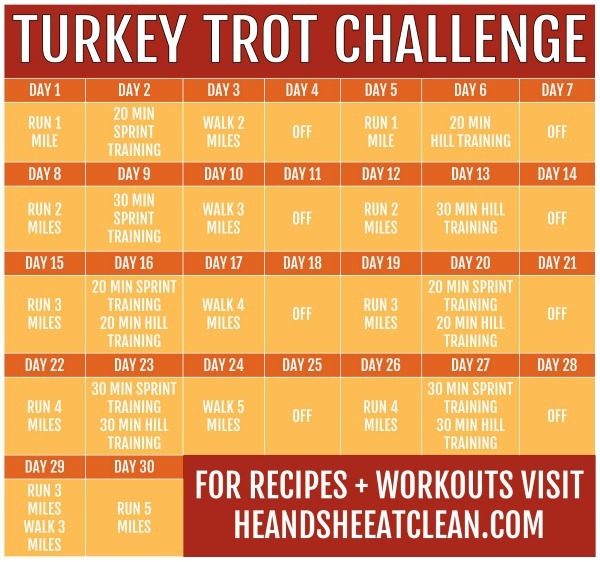 We’ve released another version of the 30-Day Turkey Trot Challenge that is more of a beginner challenge. If that is more your style, check it out here. This current one is geared towards those who are more advanced. This challenge was designed to be something that you do in addition to your normal workout (which is hopefully one of our workout plans!). We have 4, 6, and 12-week workout plans for all fitness levels! Don’t let this be your only workout, cardio is only part of the equation…weight lifting is very important also! Stay updated on all of our current fitness challenges here. 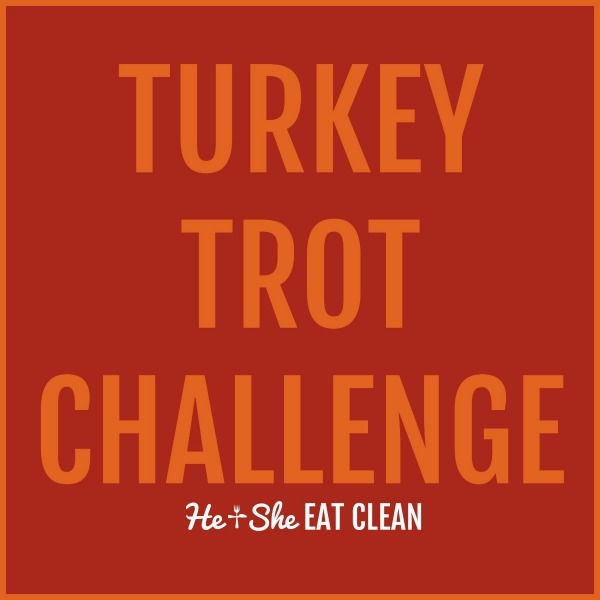 Tag us on Instagram and use the hashtag #heandsheeatclean so we can follow along! Any of this can be done on the treadmill but I always prefer to be outside when it’s nice. I would encourage you to do as much as possible outside. There’s just something different about doing cardio when you are in the nice, fresh air. This will make you faster. You choose your split. I like to do 30 seconds of sprinting and then walk for 30 seconds or 20 seconds of sprinting and then walk for 40 seconds (just depending on how fast your sprints really are)! If you are on the treadmill you can just put your legs on the side for the walk portion and completely rest during that time. When it’s time to spring again just hop back on. This will make you a stronger runner. Find a nearby hill and sprint up the hill! You can either jog back down or walk back down and do it all over again. If you are on the treadmill, set your incline high (most treadmills go to 15% but choose something that you are comfortable with but that also pushes you!) and do your splits just like you would for the running sprints.